The Copper deficient cattle I have seen have always been in situations where the animals were not grazing and were fed all purpose feeds that were tailored to sheep. Most sheep feeds, general purpose feeds, and general purpose mineral blocks are extremely low in Copper because sheep, (especially Suffolks and similar breeds) have trouble with copper toxicity and can tolerate only very low levels of this element. Copper deficiency in cattle is more common in certain areas of the country, and studies of commercial cattle show it impacts some breeds more than others. An obvious symptom of copper deficiency is often the appearance of white hair around the eyes. This “roaning” effect can eventually cover the entire face and body. 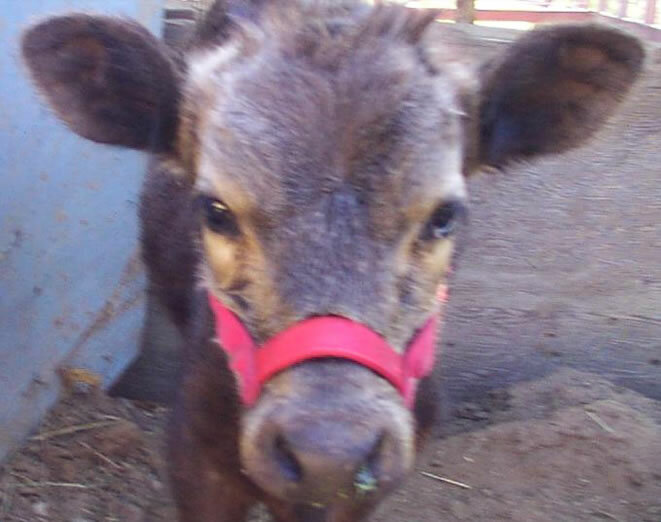 Other symptoms include diarrhea, poor weight gain, a scruffy coat, swollen or painful joints, broken bones, leg weakness, infertility, anemia, decreased resistance to disease, decreased milk production. If you think you see symptoms of copper deficiency in your animals, you should have their blood level tested. Black Dexter calf with severe copper deficiency. 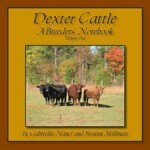 The previous owner was accustomed to horses, but not Dexters, and thought the calf was changing colors - like a black foal turning grey. The calf is now black again. If your cattle are raised with sheep and you are in a copper deficient area, you can train the cattle and the sheep to go to separate pens once a day, where the sheep will receive their regular feed, and the cattle will receive Calf Manna, (or some other copper-rich feed) with their regular ration. 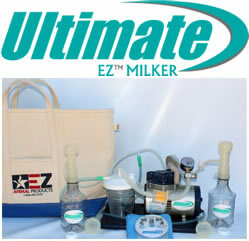 The amounts indicated on the bag are usually adequate. If you do not have sheep, there are supplemental blocks made for cattle that contain copper in the necessary levels for cattle. There are also protein tubs that work well, especially if the cattle are on poor quality hay or pasture. Crystalyx has a good product called Naturalyx that contains no animal by-products. There are two causes of copper deficiency. Primary copper deficiency is caused by a diet that is poor in copper. Secondary copper deficiency is caused by molybdenum or sulfates in the diet that interfere with copper absorption. Overgrazing can cause copper deficiency because of the ingestion of too much soil. A good article to read is Fact Sheet No. 7: Copper Deficiency, By John Maas, DVM, MS, from U.C. Davis.